With just a few ingredients you can enjoy a gourmet dish any day of the week. The sauce is a perfect for serving with plain rice and fresh steamed broccoli for a complete meal. If you prefer a different kind of fish, feel free to substitute halibut, grouper or tilapia. Spicewood Food Company Blood Orange Olive Oil is being used and can be purchased on-line. Serves 2. Double ingredient amounts to serve 4. Rinse fish, pat dry and lightly sprinkle with Kosher salt. Whisk blood orange oil, honey and soy sauce together in a small bowl. Heat sesame oil over medium high heat. Add fillets and sauté until fish releases itself easily from the pan flip and add honey, blood orange and soy sauce mixture. Using a spoon ladle the oil mixture over the fillets. Cook for about 3 – 5 minutes more to cook fish and slightly reduce sauce. 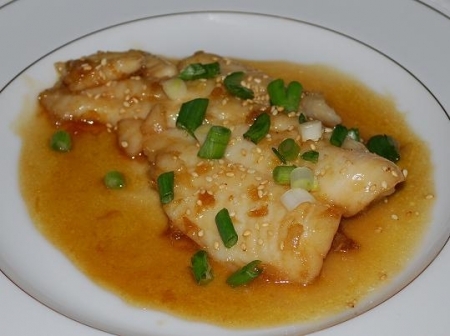 Once fish is cooked through, remove from skillet plate, pour sauce over fish and evenly top with the sesame seeds and sliced green onions. Try Procrastinate Chardonnay (California), Villa Maria Unoaked Chardonnay Private Bin (New Zealand), Jacob’s Creek Chardonnay (South Australia), Blue Moon Belgian-Style Wheat Ale with orange wedges or Samuel Adams® Summer Ale (Boston, MA).